Key Difference: SQL are also known as relational databases and are more structured than NoSQL databases, which are known as non-relational databases. Non-relational databases tend to be more document-oriented and distributed rather than structured. 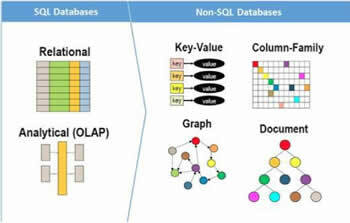 There are many different types of databases in use today. SQL Databases have been and still are some of the widely used databases out there. Some other popular one in use are MySQL, Oracle, as well as some other types of SQL databases. However, recently NoSQL databases, such as MongoDB, have been gaining popularity. Both SQL and NoSQL databases serve the same purpose for the post part, which is to act as a database, i.e. collect and organize data. NoSQL databases actually predated SQL databases, as they existed as far back as the 1960s, whereas SQL was not developed until 1974. All databases that existed prior to the popularity of SQL fall under the moniker of NoSQL. SQL are also known as relational databases and are more structured than NoSQL databases, which are known as non-relational databases. Non-relational databases tend to be more document-oriented and distributed rather than structured. For example, it can be said that relational databases are structured like phone books that store phone numbers and addresses, whereas non-relational databases are like file folders that hold everything from a person’s address and phone number to their Facebook likes and online shopping preferences. The primary difference between the two is the fact that SQL databases utilize SQL, i.e. Structured Query Language as the standardized programming language for managing relational databases as well as for performing various operations on the data in them. Whereas, NoSQL databases typically do no use tabular relations for storage and retrieval of data that are common in relational databases. Instead they are document based that store key-value pairs, graph databases or wide-column stores. NoSQL are focused primarily on the collection of documents. It is also due to this that NoSQL are ideally used to store large set of data which are commonly stored in JSON documents. Basically, this means that while the SQL databases represent data in the form of tables, NoSQL databases show key-value pair, documents, graph databases or wide-column stores, all of which do not have standard schema definitions that need to be followed. SQL databases, on the other hand, have to stick to a predefined schema. In addition to these, there are various other differences between the two. The benefit of NoSQL over SQL is the fact that it is more variable and can be adapted to fit any need. Whereas, SQL has typically been more structured and less adaptable. Queries are focused on collection of documents. Sometimes it is also called as UnQL (Unstructured Query Language). Relationships are often captured in normalized models using joins to resolve references across tables. Are horizontally scalable. Are scaled by increasing the databases servers in the pool of resources to reduce the load. Are vertically scalable. Are scaled by increasing the horse-power of the hardware. Not comparable and stable enough in high load and for complex transactional applications. Better suited for heavy duty transactional type applications, as it is more stable and promises the atomicity as well as integrity of the data. Follows the Brewers CAP theorem (Consistency, Availability and Partition tolerance). Some databases may follow ACID properties.